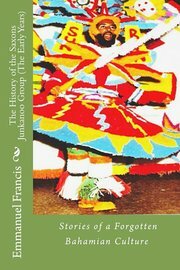 Dr. Emmanuel W. Francis’ The History of the Saxons Junkanoo Group (The Early Years)—Stories of a Forgotten Bahamian Culture—an attempt to capture and preserve the memories of the Junkanoo experience of earlier years from the perspective of the Saxons Junkanoo group—was launched in December 2013. This month, the author paid a courtesy call on Minister of Education, Science and Technology Jerome Fitzgerald. They spoke about how Junkanoo played a pivotal role in the development of good character in its participants. Mr. Fitzgerald expressed his pleasure over the book, noting that Prime Minister Perry Christie has repeatedly remarked on the need for the history of Junkanoo to be recorded. According to Tribune 242, the minister said he hopes that the writing of this history book will encourage other Bahamian authors. Description: [Dr. Emmanuel W. Francis writes] I believe that junkanoo played a pivotal role in the development of the good character of most Bahamians as it afforded us the opportunity to express our inner brilliance. It became the medium through which we would connect with the repressed ‘spirits’ of our African ancestry and discover our identity as a peculiar people. Additionally, this (junkanoo) masquerade provided our predecessors with an opportunity to express their displeasure over economic and social injustices imposed by their colonial masters and their descendants without fear of reprisal. In many aspects, the Emmanuel W. Francis culture mirrored the culture of the Bahamian people. These annual Christmas parades have created an indelible imprint on the Bahamian psyche which embodies a distinct connection between junkanoo and politics. The release of this ‘free spirit’ elevated our self- esteem and value for human life through the discovery of an inherent intimacy we had with our creator. Our creativity, genius, love, talent and perseverance, coupled with skill in music, art, drama and dance were all manifestations of this intimacy. It may seem that I am reaching a bit, but after reading our stories in this book you would favor my hypothesis on the value of the junkanoo experience to our spiritual development. The Junkanoo festival is an important part of Bahamian culture and recently there has developed an ever increasing interest in its history, but little has been written about it. Moreover, there is a growing consensus that junkanoo is not what it used to be and this has sparked a curiosity about the history of those times. Unfortunately, too much of it has been lost or forgotten as some of these junkanoo stories have been buried in our grave yards. This book is an attempt to capture and preserve the memories of the junkanoo experience of earlier years from the perspective of the Saxons junkanoo group. Dr. Emmanuel W. Francis (Manny) is a Bahamian dentist, raised in Nassau, Bahamas. Dr. Manny was inducted into the National Junkanoo Legend Circle by the Ministry of Youth, Sports and Culture and the National Junkanoo Committee in December, 2008 after 42 years of excellence and innovation in junkanoo. He is designer and builder of many winning costumes for group and individual group prizes with the Saxons and One Love Soldiers junkanoo groups. Manny introduced the four piece costume concept, (viz. hat, shoulder piece, back piece and front piece), while designing for the Saxons, 1969. This design concept has become the standard of costume design today for these magnificent parades, and is the focus of his recently Manual of Junkanoo Costume Construction-A Beginner’s Guide to Junkanoo Design (2011).